I have been working as an antiques conservator in the Washington DC area for over 39 years. 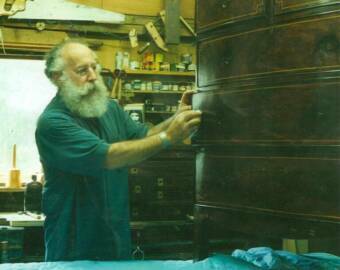 I was trained by my grandfather, William Walzer, a highly respected wood sculptor. After college, I was fortunate to work with many fine craftsman at the Smithsonian Museum (Arts and Industry building) helping construct the Bicentennial exhibit in 1976. Over the years I have worked on many fine historic pieces. My clients include the National Gallery of Art, Dumbarton Oaks, top interior designers, antique dealers and private collectors. My team of 14 and I specialize in 18th century and early 19th century furniture but are happy to work on earlier and later pieces. Using proper conservation techniques we achieve a well cared for look. We have been featured in The Washingtonian, Washington Times, Loudoun Times Mirror, The Washington Star, Chesapeake Home and Loudoun Art magazines.